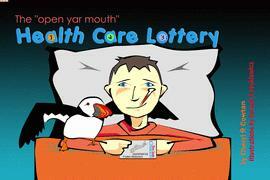 I self-published The "OpenYar Mouth" Health Care Lottery picture book in 2006. 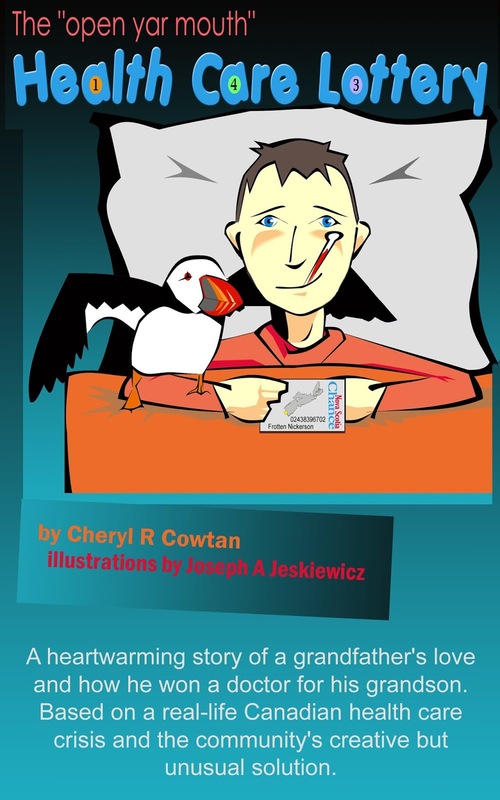 Today, I'm going to republish it as a Kindle book. I will blog as I go, and provide all the steps below. I’ve never done this before, so let's see how long it takes. 3:00 p.m. Start! 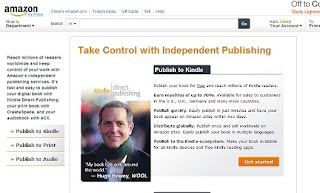 Scroll to the bottom of the page and click the menu link ""independently publish with us"
This takes you to the "Take Control of Independent Publishing" page which features three publishing options: Kindle, print and audio. For this adventure, I'm choosing Kindle. Read and (if you want) accept the terms. Once you save your bank account info, your publisher code will be showing at the left. Capture that and keep it somewhere. Here is where I got confused, because my info saved but the page stayed the same. There was no next button, so I had to click some navigation to figure out what to do next. Those navigation buttons are: Bookshelf, Reports, Community and KDP Select. 8. Read KDP Select and see if you want to publish this way. I personally am going with this option. Make sure you read the "Other FAQs" at the bottom of this page to find out more. 10. Select "Add New Title"
12. Upload a cover or create a cover - save your book details first as you will be directed to a new section for the "cover creator". 13. Lost some time here resizing/redesigning my book cover in Photoshop. My print book was a landscape layout and the Kindle is requesting a 1563 pixel wide by 2500 pixels long. That makes a difference in the cover. As well, we’re talking an RGB colour format, not the CMYK I used for the print version. See below. Okay, it's 4:55 p.m. and I'm back at it. Kindle prefers the book content to be in MS Word. Luckily, mine was, but there were some changes to make. 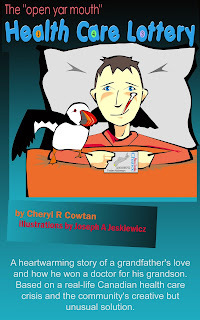 I deleted all those blank facing pages that are required by printers, added an updated bio, and my Web site link http://www.cherylcowtan.com. I also added an option to order the print version of “Open Yar Mouth” signed by moi! I'm uploading both the cover and the content, which go onto the Book Title information page. I've lost Internet connection and will continue when I find out what the problem is. 5:30 p.m.
Back on line with Internet up. Ready to try again. Let’s see how easy re-entry is. Going into Amazon.com. I’m still logged in. 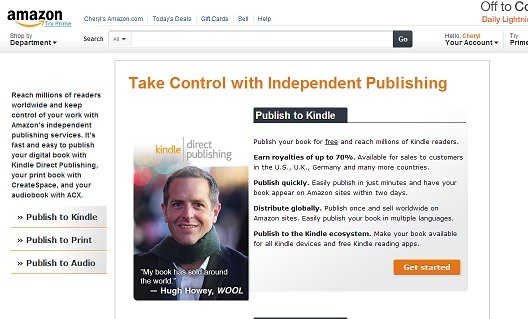 I click “My Account” and don’t see a link to the independent publishing. So I guess re-entry involves scrolling down to the link at the bottom of the page. Do I really have to click “Get Published” again? I do and then log in again and voila! My book is there waiting for me to continue “whew”. Snap! It’s uploaded! Time to preview. This is an important step and you want to take the time to do it right. 6:01 p.m. The preview shows the book pages in a mobile device screen. Make your corrections and re-upload the book content. 6:48 p.m. Preview one more time. Made more changes and re-uploaded. The content upload can take a while. 7:30 p.m. When you are finally done correcting and uploading, click "Save and Continue". Next is to determine whether your royalty will be 70% or 35%. I started out wanting to select a 70% royalty, which requires pricing my book at a minimum of $2.99. However, upon further reading of the "Pricing" page (which is buried in the Terms and Agreements), I found that I will be charged for each MB of data each time my book is purchased. "Open Yar Mouth" is a picture book of 35,000 KB. This equals 35 MB multiplied by .15 cents for each Canadian/US order. If I chose a 70% royalty, each book would sell for $2.99 and my delivery charges from Amazon would come to $5.25. That's a losing proposition. My other option is to choose a 35% royalty, which frees me from delivery charges, but has a restricted minimum price per book based on how many MB my book is. It just so happens that any book over 10 megabytes has to have a minimum price of $2.99. Set your pricing for each territory listed starting with American and ending with Canadian. At the bottom of the page, I found this statement "Your book file size after conversion". is So, before you decide on your royalty, scroll to the bottom of this page and find out what your book size is AFTER Kindle conversion. At 1.82 MB, I will only be paying approx .30 per book for delivery. I can live with that. I have gone back up the form and changed my royalty to 70%. 8:00 p.m. and I am clicking the "Publish" button! I have officially published my first eBook using Amazon's Kindle Direct Publishing and it took me 5 hours to get through the process. Next time will be quicker, I'm sure. Now I wait up to 12 hours for my book to be reviewed.